Announced on the opening day of Hello! Project's Summer 2017 Tour ~HELLO MEETING~ 2017/7/15. - Must be among the ages 9-17 at the time of application. - Must not be affiliated with any other agencies at the time of application. Audition Winners may be added to ANY existing Hello! Project group, a new group, or join the Engeki Joshibu Theater Club. To commemorate Hello! Project's 20th Anniversary next year, Hello! Project is getting their own AbemaTV regular show. This year, Hello! Project is having an audition for their 20th Anniversary. To make this a memorable audition, they will have a TV camera follow the audition. Its been 7 years since a TV camera followed an audition. In addition, Abema video will also upload separately on their site, the unpublished footage and original stories from the audition. Just search "ハロプロ". In the studio, Hello! Pro OG members and active H!P member will be watching the 20th Anniversary auditions. Also, it seems that Yaguchi, Yasuda, Kumai, Ayacho, Kanatomo, and Sayubee will be a part of the show too. This thread is for the purpose of discussing / sharing "infographics" or graphs/charts highlighting facts and stats of various Hello! Project groups (i.e. 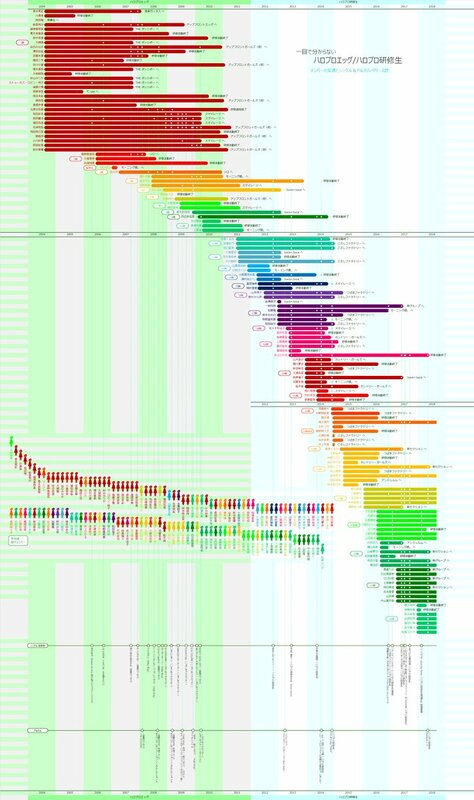 Member tenures, lineups, single history, member age, member colors, etc.). Someone named Sato Ryu AKA "Visualizer X" was the first to create these "infographics" and still does updates on them. Since being popularized, others have started to create their own infographics similar to the ones made by Visualizer X. Being a huge stats nerd, these graphs are EVERYTHING and I look at them often. Actually, the reason I am a fan of H!P is because of the Morning Musume chart made by Visualizer X. I thought it was the coolest, prettiest and most well-put-together thing, and it made me appreciate the group's whole concept. Below are the updated infographics along with facts/information about who makes them. - Visualizer X states that anyone who loves Morning Musume / Hello!Project are allowed to use the graphs. 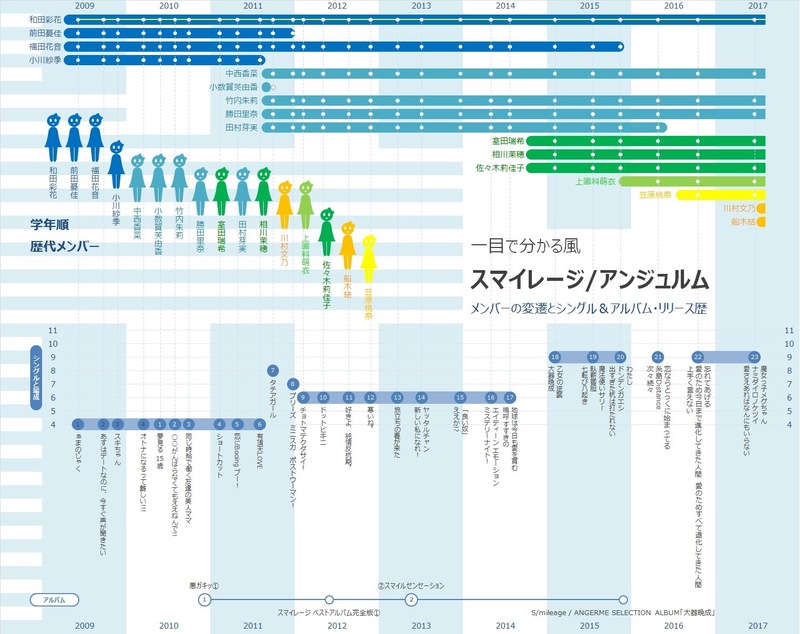 - The Morning Musume infographic was created in 2011. 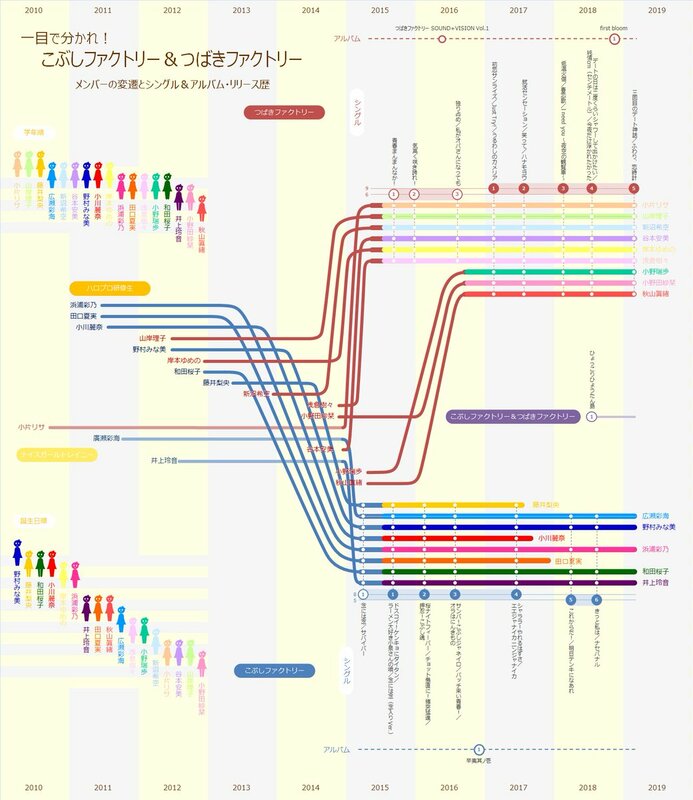 - The Morning Musume infographic is still being regularly updated solely on Morning Musume's Wikipedia page (both Japanese and English versions). Visualizer X seems to normally upload the new version on days where a single is being released, and includes all graduations / additions that happen in between the time of the previous single and the one being released. - The BerriKyuu infographic was created in 2013, and completed in June 2017. 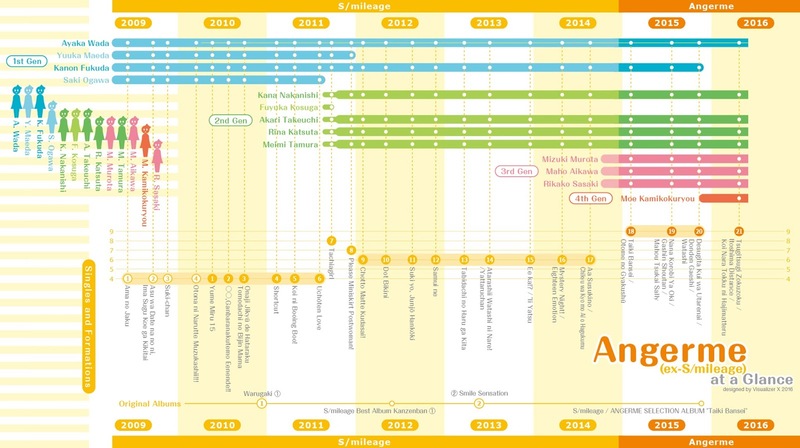 - The ANGERME infographic was created in 2015. - Visualizer X has said that they use Adobe Illustrator to create the infographics. - Visualizer X has said that they would like to start an infographic that shows all Hello! Project groups and their tenures within Hello! Project, but it may be quite a big work, so they would need a lot of time to complete it. Visualizer X graphs LATEST UPDATES! - Started to post Infographics on Twitter in June 2017, seemingly modeled after / inspired by Visualizer X's infographics. Utamurashima (twitter @utamurashima) graphs LATEST UPDATES!